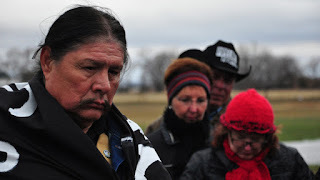 Native Americans are opposed to the 1,179-mile (1,897km) Keystone XL project, a system to transport tar sands oil from Canada and the northern United States to refineries in Texas for various reasons, including possible damage to sacred sites, pollution, and water contamination. While the Keystone XL pipeline remains mired in controversy between oil interests and environmental advocacy groups, another tar sands pipeline that will run for hundreds of miles through the American midwest looks to be on the fast track for approval. With space on pipelines transporting oil sands from producers to refineries almost at capacity, Canada’s largest pipeline company Enbridge is looking to build a new 600-mile-long line that will carry Alberta oil sands from Flanagan, Illinois 100 miles southwest of Chicago to a terminal in Cushing, Oklahoma and then onto Gulf Coast refineries, reports the AP. Enbridge, perhaps hoping to avoid the delays that have hampered construction of Keystone XL, has sought an expedited permit review by the US Army Corps of Engineers for the planned Flanagan South pipeline. Doug Hayes, a lawyer working on behalf of Sierra Club, the environmental advocacy group, cites suspicions over Enbridge’s strategy of seeking regulatory approval for its new pipeline under the Nationwide 12 permit process, bypassing Clean Water Act requirements that include public notification and environmental reviews. By seeking approval for a pipeline that will ultimately run for hundreds of miles in smaller portions, the company would thus avoid regulations that apply to large utility projects with multiple water crossings. "This is a 600-mile project that will clear everything in its path for a 100-foot right of way, and they're treating it as thousands of separate, little projects," said Hayes. 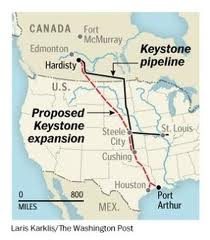 Legally, Flanagan South differs from Keystone XL in that the new extension will originate within US territory, thereby not requiring the same State Department approval. Environmental activists are apprehensive about the pipeline regardless, pointing to the Enbridge Michigan pipeline spill that dumped hundreds of thousands of gallons of oil into the Kalamazoo river three years ago. Mark DuCharme with the Michigan Department of Environmental Quality says the massive clean up following that spill has been tough owing to the river’s water levels at the time of the pipeline’s eruption, which were at flood stage. "The river flooded up out of the banks, into the flood plain and extended out into people's properties," DuCharme told Michigan’s WLNS. In the hopes of reassuring homeowners and others regarding its new pipeline, Enbridge has scheduled a number of 'open houses' in Missouri, Kansas and Illinois in a bid to pitch the project to the public. The Flanagan South plan has attracted little public attention so far, with a handful of Sierra Club protesters turning up last week at one of the town meetings in Marshall, Kansas, 90 miles east of Kansas City. The massive pipeline corporation has been touting the number of short-term construction jobs to be brought in by the new project, which also resulted in prospective pipefitters showing up at the Marshall open house. Barack Obama a mis en doute, samedi 27 juillet, l'idée que l'oléoduc Keystone XL créera de nombreux emplois aux Etats-Unis, comme l'affirment les promoteurs de ce projet controversé. "Les républicains disent que cela générera beaucoup d'emplois", a déclaré le président américain dans une interview publiée samedi par le New York Times. "Rien ne prouve que cela soit vrai. Selon les estimations les plus réalistes, cela pourrait créer 2 000 emplois pendant la construction de l'oléoduc, ce qui pourrait prendre un an ou deux. Ensuite, on parle de 50 à 100 emplois dans une économie de 150 millions d'actifs." Présenté pour la première fois en 2008, le projet de TransCanada Corp. est de transporter 830 000 barils par jour de pétrole brut extrait des gisements de sables bitumineux canadiens et de la formation de Bakken, à cheval entre Dakota du Nord et Montana, jusqu'aux raffineries du golfe du Mexique. Le coût des travaux est évalué à 5,3 milliards de dollars. Les républicains et les milieux d'affaires font pression sur l'administration Obama pour qu'elle approuve Keystone XL, auquel s'opposent les défenseurs de l'environnement, en raison des émissions de gaz carbonique induites par le projet. Le mois dernier, le président américain a déclaré que l'oléoduc ne servirait les intérêts des Etats-Unis que s'il est prouvé qu'il n'aggrave pas la pollution de manière importante .Selon le Times, Barack Obama a laissé entendre que le Canada pourrait faire davantage pour "réduire les émissions de carbone". Le président américain conteste aussi l'argument selon lequel l'oléoduc fera baisser les prix de l'essence. La décision de l'administration Obama est attendue avant la fin de l'année ou début 2014.